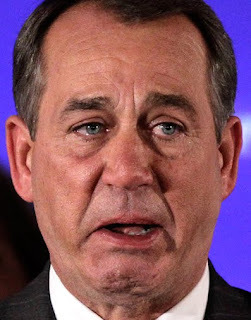 The Ostroy Report: Is John Boehner a Crybaby? Is John Boehner a Crybaby? What's with John Boehner and all the crying? It seems the Republican Party's new Speaker of the House can't seem to talk about anything these days without an uncontrollable emotional outburst. He's an unhinged sobbing mess whether he's on the House floor arguing a bill; talking about his childhood during a victory speech; or reacting to his wife's praise during Sunday night's "60 Minutes" interview. Jeez, the guy cries more than my 6-year-old daughter. Now don't get me wrong. I'm all for men showing their emotions, and crying is a big part of that. I actually have a lot of respect for Boehner and his obvious comfort in expressing himself this way. He's clearly secure enough with himself and his masculinity, and he should be considered a terrific role model for young boys who need to know it's ok to show their emotions and cry. But when it comes to Boehner, what should be noted is the free pass Democrats have given him for these emotional outbursts. Can you imagine if he were a liberal? Can you imagine how the Republican attack machine would mock and denigrate him and besmirch his character? How they'd portray him as a sissy and weakling, unsuitable to handle the intense pressures and stress of one of the most important, powerful jobs in Washington? Too emotional and fragile to be second in the line of succession for the presidency? You can be sure the attacks would be vicious and relentless. Just remember how the GOP media thugs attacked and questioned John Kerry's war record during the 2004 election. Or the nonsense earlier this year about how Harry Reid and other Democrats need to "man up." In a political landscape where the rhetoric and vitriol spews incessantly and the smears over one's masculinity is about as common as a Tea Party attack on "big government," you can bet that the homophobic vituperation and character-assassination of Boehner would be certain if he sat on the other side of the aisle.